This eight course lute has a natural finish and is made for a right handed player. You can easily attach your own shoulder strap for playing to the end peg. The body has sheesham staves accented white pinstripes in between. The neck, end peg and tuning pegs are also made out of sheesham. The nut is bone. The mustached bridge is sheesham, a top section of lacewood adds elegance and strength. The sound board is made out of Canadian spruce and the single sound hole has an intricate laser cut design. This lute has 8 nylon frets on neck and 4 finished sheesham frets on sound board. There are 4 nylon wound strings and 11 rectified nylon strings in seven courses of two strings and one course of a single string. Shades of wood color may vary. Accessories included: the book: Learning to Play the Lute” (LUTB) and a padded gig bag. The tuning for this Lute is the normal 8 course tuning, but can vary depending on player preference. NOTE: No Warranty on Strings: Whether you purchase an instrument on-line or in a neighborhood store, manufacturers recommend that you change the strings on your instrument as soon as you receive it. 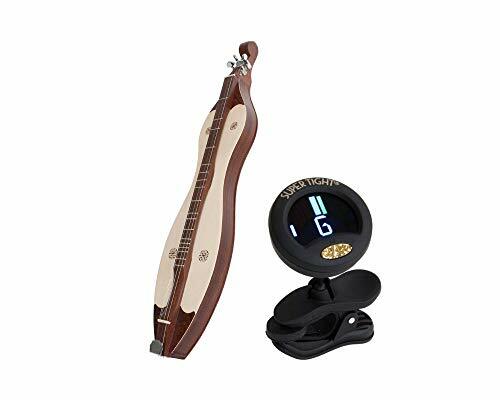 Features: Deluxe Padded Gig Bag Included Learn to Play Lute Book Included Top: Solid Canadian Spruce Boby & Neck: Solid Sheesham Body/Bowl: 18″ in length, 7″ in width and 12.25″ in height Neck at Nut: 2.79 inches in width Neck at Body Joint: 3.3 inches in width Nut: 2.79″ in width, .23″ in height. Made from sheesham & has string slots Scale Length: 23.68 inches Item Length: 30.375 Inches Item Height: 12.25 Inches Item Width: 9.875 Inches 15 sheesham tuning pegs Item Weight: 2.4 lbs Item Weight w/ Case: 9 Lbs Ship Weight: 41 lbs Shipped insured Brand New!